Former Great British Bake Off stars Tamal Ray, Selasi Gbormittah, Jane Beedle and Andrew Smyth have shared their opinion on the new Channel 4 series. Last year the BBC waved goodbye to the much-loved baking show when rival broadcaster Channel 4 bought the rights for a suspected £75m. 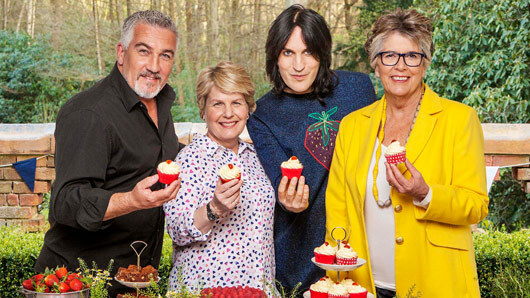 Bake Off fans are now preparing themselves for change after Mary Berry, Sue Perkins and Mel Geirdroyc decided to remain with the BBC and Prue Leith, Noel Fielding and Sandi Toksvig were confirmed as their replacements. However, the former Bake Off stars seem to think that this change will only be a positive one. “Moving the show from BBC One to Channel 4 won’t have any impact on the show’s popularity,” Selasi told Digital Spy at the BAFTA Awards. The new cast announcement received backlash from certain viewers who argued that Noel will not appeal to a GBBO audience. Jane, on the other hand, has insisted that the presenter does in fact have universal appeal. She said: “I’m a huge fan of his and I love The Moon song! I think bringing him in is a genius idea. “One thing a lot of people have been complaining about is that the show could lose its cult following of oldie fans because of Noel. But let me tell you, us oldies are a generation that love shows like Monty Python. “We love that sense of humour! So I think people will love him. Last month, Channel 4 confirmed that there will remain an hours worth of viewing material in the 2017 series. When the popular baking series made the transfer from the BBC to Channel 4 last year, many fans of the show were concerned that the regular advert breaks would mean a reduced amount of Bake Off content. However, it turns out that the new series will run for 75 minutes per episode.